Avocado toast: It’s sort of healthy, sort of indulgent and undeniably delicious. It's the sort of thing that's so dead simple you could make it at home…but isn't it just, well, better at a restaurant? 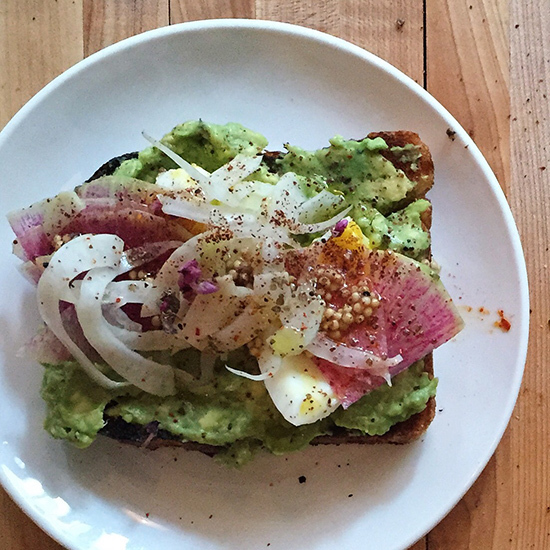 Despite the ignominious title of “most annoying food on Instagram” avocado toast’s popularity shows no signs of waning. And really, what's not to love? Avocado has always been a killer sandwich ingredient, so the idea of just promoting it to the starring attraction is pretty brilliant. The bread. You'll generally find avocado smashed on something healthy-looking—maybe a grain bread for that wholesome, pseudo-Californian vibe. The filling. At least a big half-avocado (anything less is just skimping), generally mashed onto toast; sliced avocado might be a little more elegant, but the smush-it-on aesthetic is a little more fun. Lemon and salt are necessary for simpler sandwiches. From there, let your imagination reign. Café Gitane, New York City. Long before there were dozens of Pinterest boards dedicated to—hell, long before the invention of Pinterest—Café Gitane perfected its version. The ur-avo-toast is simple: avocado with lemon juice, olive oil and chile flakes on 7-grain toast. Slab Sandwiches & Pie, Seattle. Start with house-baked farro bread, nice and crisp from the griddle; avocado slices topped with tomato-ginger jam and frisée; and then—the ridiculously delicious part—crisped-up chicken skin to add salty, savory crunch.